The perfect Carrot Cake should be moist and have a consistent golden brown colour. Pecan’s and sultanas add to the moistness and texture of the cake. But the secret is using the right oil to bring the mixture together. 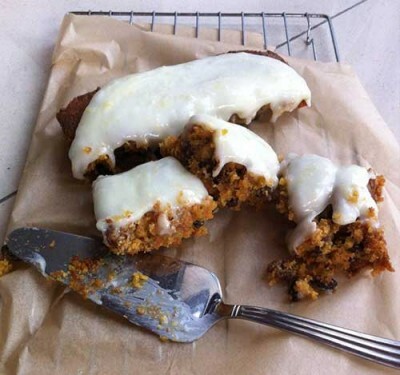 For this recipe, we’ve taken a healthy twist and used Rapeseed Oil by Donegal Rapeseed Oil along with a light cream cheese icing – guilt free deliciousness!! This all-in-one, tray bake version is so simple to make and cooks in minutes. 1. Preheat the oven to 150C. Grease and line a rectangle tin with greaseproof paper. 4. Pour the mixture into the prepared tin, smooth the surface and bake in the oven for 20 minutes, or until until a skewer inserted into the middle comes out clean. Remove from the oven and allow the cake to cool in the tin before icing and serving. 5. For the icing: beat the cream cheese and icing sugar using an electric whisk until well combined. Add the finely grated lemon zest and juice and mix until the icing is smooth and thick. Using a palette knife, spread the icing evenly over the cooled cake.